Increasing variation in the climate has been implicated as a possible factor in the evolution of our species (Homo sapiens) 300,000 years ago, as well as the more recent demise of our enigmatic evolutionary cousins, the Neanderthals. But knowing the impact of that change on a year-by-year basis has always been a challenge. Most prehistoric climate models are derived from large-scale records such as deep-sea cores or terrestrial sediment layers. These methods yield information on the scale of thousands of years, making it impossible to understand how seasonal climate patterns directly impacted ancient humans and their evolutionary kin. My colleagues and I have found a solution using clues from our own mouths, as we detail today in an article in Science Advances. 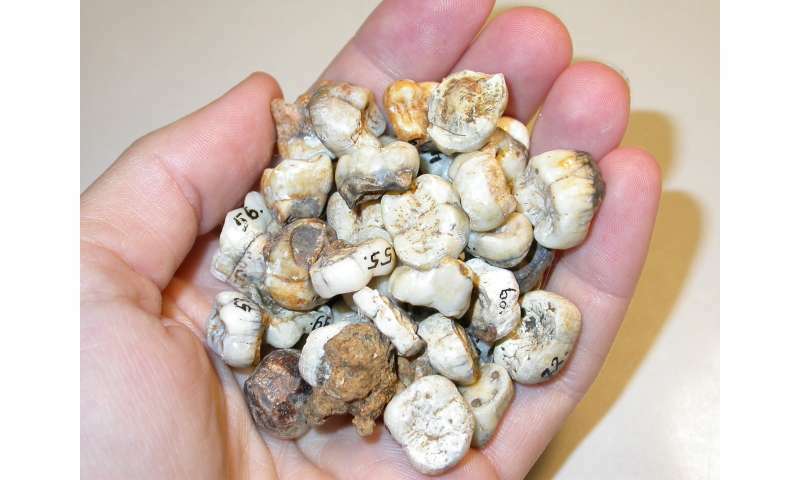 We used teeth to reveal climate records formed during the development of ancient hominins. Teeth are a really useful indicator of past environments. This is possible because teeth have biological rhythms and key events get locked inside them. These faithful internal clocks run night and day, year after year, and include daily growth lines and a marked line formed at birth. Histologists like me carefully saw teeth, remove tiny slices and painstakingly map records of microscopic growth during childhood. For this new study, we examined the enamel in fossilised teeth from two Neanderthal children (dated to 250,000 years ago) and one modern human child (dated to 5,000 years ago) from an archaeological site in southeastern France known as Payre. Using the sensitive high-resolution ion microprobe (SHRIMP) at the Australian National University we measured how the oxygen isotope ratios varied on a weekly basis in these ancient teeth. Our approach is based on the fact that two naturally-occurring atomic variants of oxygen vary in predictable ways. During prolonged periods of warm weather, surface water is higher in the heavy variant of oxygen. The opposite pattern occurs during cool periods. When individuals drink from streams or pools of water, values from these sources are recorded in the hard mineral component of forming teeth. The SHRIMP measurements allowed us to create multiyear paleoenvironmental records from the fossil teeth. 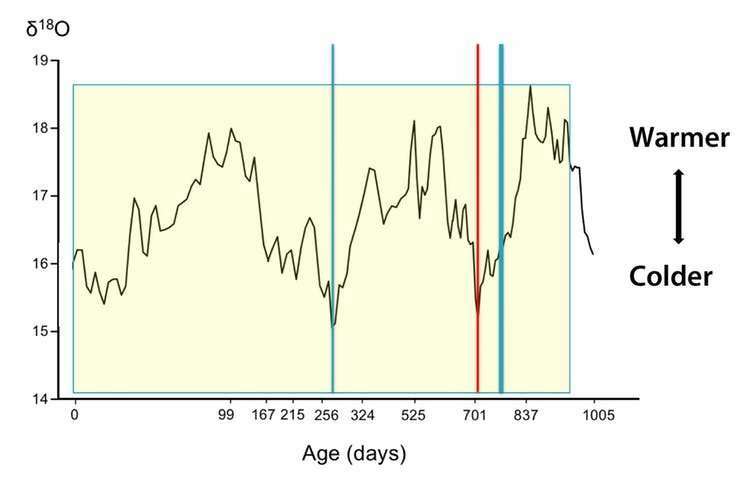 A 250,000-year-old Neanderthal tooth yields an unprecedented record of the seasons of birth (age 0), nursing (yellow box), illness (red line) and lead exposures (blue lines) over the first 2.8 years of this child’s life. Oxygen isotope values sampled on a weekly basis are shown as a ratio of heavy to light variants. The oxygen records show that the two Neanderthals inhabited cooler and more seasonal periods than the modern human who grew up in the same place more recently. This is consistent with our basic understanding of ancient climates in France, as 250,000 years ago this region was cooler than it has been over the past 10,000 years, when the unlucky modern human child lived and died. We've already shown that teeth preserve faithful records of milk intake during nursing, proving that orangutan mums are lactation champs – they nurse their infants for eight or more years. 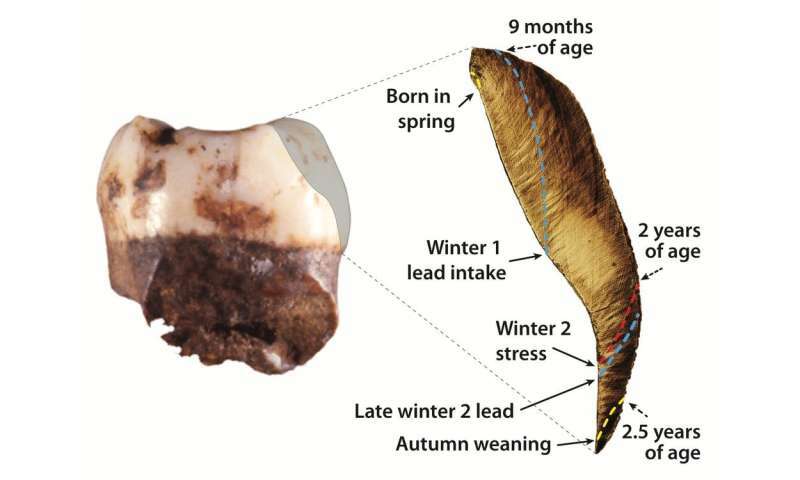 In the current study we were able to pair seasonal cycles during tooth formation with nursing behaviour, showing that one Neanderthal child was born in the spring and stopped consuming its mother's milk 2.5 years later, during the autumn. Even more surprising is the fact that both Neanderthal children were exposed to lead at least twice during cooler times of the year, likely through consumption of contaminated food and/or water. Lead occurs naturally in several historic mines in this region of France, and this is the oldest known prehistoric exposure to this neurotoxic substance. No level is considered safe for humans or animals, and these exposures occurred during a critical time in the early lives of these Neanderthals. These findings raise intriguing questions about Neanderthal behaviour that require further study, and youngsters with unworn teeth are especially helpful. Although dozens of young Neanderthals have been unearthed, coaxing teeth from the curators of collections for this kind of semi-destructive study is a tall order. But the more teeth we are able to examine in such detail, the more information we will gather about the lives of ancient people on a year-by-year basis. Our approach will also facilitate much-needed tests of theories about the impact of climate change on human technological development, and insight into Neanderthal nursing behaviour—a key determinant of population growth and life history. Previously, my colleagues and I discovered that an eight-year-old Belgian Neanderthal was weaned at 1.2 years of age. This probably was atypical as the nursing signal dropped off rapidly and the individual showed stress in its first molar at this exact time. We're not sure if this means that it was separated from its mother or just really sick – but it's likely that Neanderthals kids nursed for longer when they could. Our new approach allows scientists to flesh out the lives of ancient children with unprecedented detail, including fine-scaled views of life in Ice Age Europe, through the remarkable tales their teeth tell.